“What am I always telling you is the first thing to think about when you are on lead with one face-down card in the stock?” Hans asks. “Well done, dear! That is indeed something else to consider. But, in that case, anything you lead next will give Tibor the trick, and eventually you will have to make some more trick points. © 2017 Martin Tompa. All rights reserved. I am a Professor of Computer Science & Engineering at the University of Washington, where I teach discrete mathematics, probability and statistics, design and analysis of algorithms, and other related courses. I have always loved playing games. Games are great tools for learning to think logically and are a wonderful component of happy family or social life. 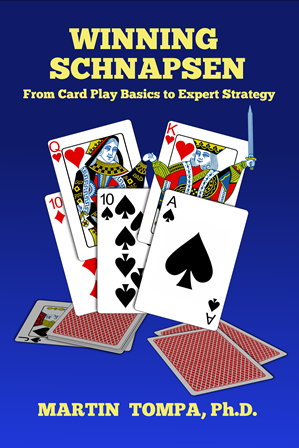 Read about Winning Schnapsen, the very first and definitive book on the winning strategy for this fascinating game.